The 2009 World Men's Handball Championship (21st tournament) took place in Croatia from 16 January to 1 February, in the cities of Split, Zadar, Osijek, Varaždin, Poreč, Zagreb and Pula. Croatia was selected from a group of four potential hosts which included the Czech Republic, Greece and Romania. The opening game and ceremony were held in Split, and the final game was played in Zagreb. France won the tournament after defeating Croatia in the final. Poland took the third place after winning over Denmark. Tickets for the tournament went on sale from 15 to 20 November. For the finals, ticket prices started at 700 kuna (c. €95). To promote the tournament, the Croatian National Tourist Board launched a series of presentations in the capitals of 13 participating countries. During the championship internal criticism arose against Hassan Moustafa, President of the IHF. The secretary general of the IHF, Peter Mühlematter, criticized Moustafa and asked for his demission. Moustafa asked to exclude Mühlematter after his criticism. 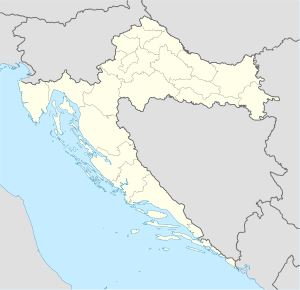 Seven Croatian cities were selected as hosts for the 2009 Championship: Split, Zadar, Osijek, Varaždin, Poreč, Zagreb and Pula. The sites included the new Spaladium Arena in Split and Arena Zagreb, where the final took place. The draw for the groups of the preliminary round was held on 21 June 2008, in Zagreb. The draw took place at Zagreb's central Ban Jelačić Square and was hosted by Filip Brkić and Kristina Krepela. The teams placed first, second and third (shaded in green) qualified to the main round. Jérôme Fernandez, Didier Dinart, Guillaume Gille, Daniel Narcisse, Guillaume Joli, Daouda Karaboué, Nikola Karabatić, Christophe Kempe, Franck Junillon, Thierry Omeyer, Joël Abati, Luc Abalo, Cedric Sorhaindo, Michaël Guigou, Sebastien Bosquet and Sebastien Ostertag. German officials Bernd Ullrich (left) and Frank Lemme (right) refereed the opening match between Croatia and South Korea on 16 January. On 12 October 2008, the match officials for the tournament were confirmed. But due to injury, the Swedish referee team Rickard Canbro and Mikael Claesson had to withdraw from the championship, and was replaced by Danish duo Per Olesen and Lars Ejby Pedersen. ^ a b "The EHF Body of 1st Instance has dealt with the abandoned Bosnia Herzegovina vs Hungary game". eurohandball.com. Archived from the original on 22 June 2008. Retrieved 19 June 2008. ^ a b Runners-up Croatia and 4th-placed Germany had already secured their places at the World Championship before the European Championship. Wikimedia Commons has media related to 2009 World Men's Handball Championship.